The U.S. Department of Transportation is proposing regulations that would make trains carrying oil safer. There have been several fiery oil train derailments in other parts of the country in the past year, and last July, a train carrying crude oil from North Dakota's Bakken formation exploded in the town of Lac-Mégantic, Quebec, killing 47 people. The new rules include lower speed limits, better brakes and safer rail cars. "We're pleased to see that these recommendations were made," said Kelly Huston, a deputy director at California's Office of Emergency Services. State regulators have been pushing for tighter federal regulations on oil trains. Currently, one train a week carries a minimum of one million gallons of Bakken from North Dakota to a rail yard in Richmond. Along with the proposed rules, the D.O.T. also issued a report finding that crude from the Bakken is more volatile than crude from other parts of the U.S., and that "there is an increased risk of a significant incident involving this material due to the significant volume that is transported, the routes and the extremely long distances it is moving by rail." "There's no doubt we're going to have better tank cars," said Patti Goldman, an attorney with Earthjustice. She welcomes the rules, but says she doesn't like the timeline, which doesn't require the unsafe rail cars to be phased out until October, 2017. "It's just going to happen too slowly and for too small a part of the hazardous shipments that we have on the rails." Last week, Earthjustice filed a petition asking for older rail cars to be phased out immediately. 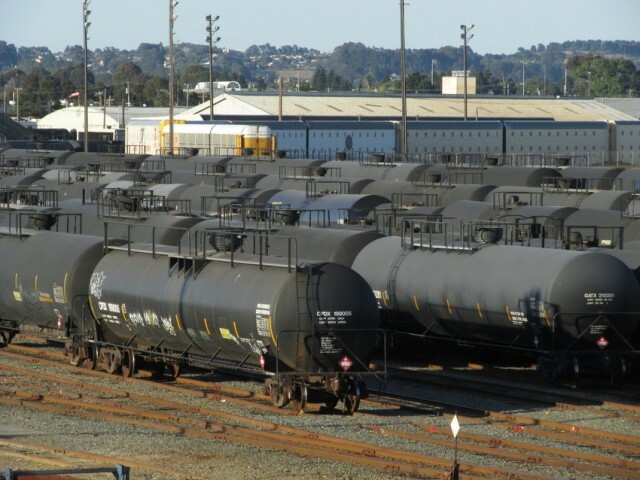 According to California officials, as much as 82 percent of crude oil shipped in the U.S. -- including the Bakken crude -- is carried in old tank cars that cannot protect against explosions. Trains delivered more than six million barrels of oil to California last year, from North Dakota, Alberta, Wyoming and other western states. State officials project that by 2016, the amount of crude traveling into California by train could surpass 100 million barrels. Huston said the regulations are just one piece of improving crude-by-rail safety. "We also have to provide better training for our first responders," he said. "We should expand our hazardous materials response capability in the state, and we should look at regulating and inspecting the railroads more closely." California recently hired more rail safety inspectors. Huston said the OES is now evaluating what training the hazardous materials response teams need, and whether the teams are located in the best places to respond if there were an oil train accident. The Association of American Railroads, an industry group, said in a statement it's reviewing the D.O.T. 's proposals. A spokesman for the Western States Petroleum Association, which represents oil refiners, said they needed more time to review the regulations before commenting. The D.O.T. is now accepting public comment.